Point-to-point WANs can be used to connect a pair of routers at multiple remote sites. However, an alternative WAN service, Frame Relay, has many advantages over point-to-point links, particularly when you connect many sites via a WAN. To introduce you to Frame Relay, I focus on a few of the key benefits compared to leased lines. One of the benefits is seen easily by considering Figures 4-7. In Figure 4-7, a main site is connected to two branch offices, labeled BO1 and BO2. The main site router, R1, requires two serial interfaces and two separate CSUs. But what happens when the company grows to 10 sites? Or 100 sites? Or 500 sites? For each point-to-point line, R1 needs a separate physical serial interface and a separate CSU/DSU. As you can imagine, growth to hundreds of sites will take many routers, with many interfaces each and lots of rack space for the routers and CSU/DSUs. Now imagine that the phone company salesperson talks to you when you have two leased lines, or circuits, installed as in Figure 4-7: "You know, we can install Frame Relay instead. You will need only one serial interface on R1 and one CSU/DSU. To scale to 100 sites, you might need two or three more serial interaces on R1 for more bandwidth, but that's it. And by the way, because your leased lines run at 128 kbps today, we'll guarantee that you can send and receive that much to and from each site. We will upgrade the line at R1 to T1 speed (1.544 Mbps). When you have more traffic than 128 kbps to a site, go ahead and send it! If we've got capacity, we'll forward it, with no extra charge. And by the way, did I tell you that it's cheaper than leased lines anyway?" :z the next few pages, you will see how Frame Relay works and realize how Frame Relay can provide functions claimed by the fictitous salesman. Frame Relay networks provide more features and benefits than simple point-to-point WAN links, but to do that, Frame Relay protocols are more detailed. Frame Relay networks are multiaccess networks, which means that more than two devices can attach to the network, similar to LANs. To support more than two devices, the protocols must be a little more detailed. Figure 4-8 reflects the fact that Frame Relay uses the same Layer 1 features as a point-to-point leased line. For a Frame Relay services, a leased line is installed between each router and a nearby Frame Relay switch; these links are called access links. The access links run the same speeds and use the same signaling standards as do point-to-point leased lines. However, instead of extending from one router to the other, each leased line runs from one router to a Frame Relay switch. The difference between Frame Relay and point-to-point links is that the equipment in the telco actually examines the data frames sent by the router. Each frame header holds an address field called a data-link connection identifier (DLCI). The WAN switch forwards the frame, based on the DLCI, through the provider's network until it gets to the router on the other side of the network. Because the equipment in the telco can forward one frame to one remote site and another frame to another remote site, Frame Relay is considered to be a form of packet switching. However, Frame Relay protocols most closely resemble OSI Layer 2 protocols; the term usually used for the bits sent by a Layer 2 device is frame. So, Frame Relay is also called a frame-switching service. The terms DCE and DTE actually have a second set of meanings in the context of any packet-switching or frame-switching service. With Frame Relay, the Frame Relay switches are called DCE, and the customer equipment—routers, in this case—are called DTE. In this case, DCE refers to the device providing the service, and the term DTE refers to the device needing the frame-switching service. At the same time, the CSU/DSU provides clocking to the router, so from a Layer 1 perspective, the CSU/DSU is still the DCE and the router is still the DTE. It's just two different uses of the same terms. Figure 4-8 depicts the physical and logical connectivity at each connection to the Frame Relay network. In contrast, Figure 4-9 shows the end-to-end connectivity associated with a virtual circuit. The logical path between each pair of routers is called a Frame Relay virtual circuit (VC). In Figure 4-9, a single VC is represented by the trio of parallel lines. Typically, the service provider preconfigures all the required details of a VC; these VCs are called permanent virtual circuits (PVCs). When R1 needs to forward a packet to R2, it encapsulates the Layer 3 packet into a Frame Relay header and trailer and then sends the frame. R1 uses a Frame Relay address called a DLCI in the Frame Relay header. This allows the switches to deliver the frame to R2, ignoring the details of the Layer 3 packet and caring to look at only the Frame Relay header and trailer. Just like on a point-to-point serial link, when the service provider forwards the frame over a physical circuit between R1 and R2, with Frame Relay, the provider forwards the frame over a logical virtual circuit from R1 to R2. Frame Relay provides significant advantages over simply using point-to-point leased lines. The primary advantage has to do with virtual circuits. Consider Figure 4-10 with Frame Relay instead of three point-to-point leased lines. 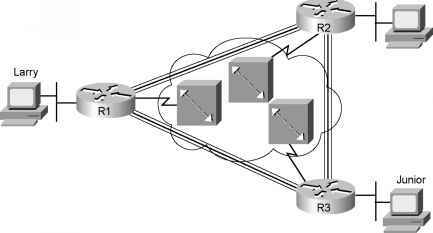 Frame Relay creates a logical path between two Frame Relay DTEs. That logical path is called a VC, which describes the concept well. A VC acts like a point-to-point circuit, but physically it is not, so it's virtual. For example, R1 terminates two VCs—one whose other endpoint is R2 and one whose other endpoint is R3. R1 can send traffic directly to either of the other two routers by sending it over the appropriate VC, although R1 has only one physical access link to the Frame Relay network. VCs share the access link and the Frame Relay network. For example, both VCs terminating at R1 use the same access link. 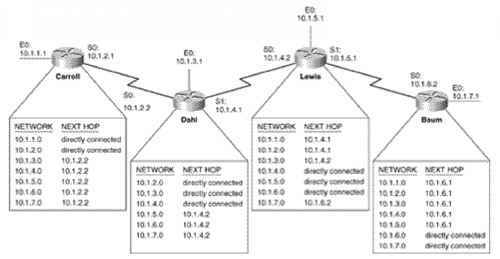 So, with large networks with many WAN sites that need to connect to a central location, only one physical access link is required from the main site router to the Frame Relay network. If point-to-point links were used, a physical circuit, a separate CSU/DSU, and a separate physical interface on the router would be required for each point-to-point link. So, Frame Relay enables you to expand the WAN but add less hardware to do so. Many customers of a single Frame Relay service provider share that provider's Frame Relay network. Originally, people with leased-line networks were reluctant to migrate to Frame Relay because they would be competing with other customers for the provider's capacity inside the cloud. To address these fears, Frame Relay is designed with the concept of a committed information rate (CIR). Each VC has a CIR, which is a guarantee by the provider that a particular VC gets at least that much bandwidth. You can think of CIR of a VC like the bandwidth or clock rate of a point-to-point circuit, except that it's the minimum value— you can actually send more, in most cases. It's interesting that, even in this three-site network, it's probably less expensive to use Frame Relay than to use point-to-point links. Now imagine an organization with a hundred sites that needs any-to-any connectivity. How many leased lines are required? 4950! Besides that, you would need 99 serial interfaces per router. Or, you could have 100 access links to local Frame Relay switches—1 per router—and have 4950 VCs running over them. Also, you would need only one serial interface on each router. As a result, the Frame Relay topology is easier for the service provider to implement, costs the provider less, and makes better use of the core of the provider's network. As you would expect, that makes it less expensive to the Frame Relay customer as well. For connecting many WAN sites, Frame Relay is simply more cost-effective than leased lines.